Post some pics of those cool Linux desktops. I just freshly installed Ubuntu Netbook Edition on my Asus 901 EeePC; haven't had the chance to really customized it yet, but here it is. I'm probably going to wipe Gnome and replace it with LXDE. I'll update this post later and add my desktop setup as well. Fairly recent screenshot. Using CLFS with Fluxbox as my window manager. Here is mine. KDE 4.2 with the Tragedy plasma theme on Gentoo. Sorry for the duplicate, my internet connection is really bad, so I when I refreshed my browser when the page failed to reload the post got reposted. Is there any way I can delete the extra one? This was 2 or 3 months ago but it still looks the same lol. 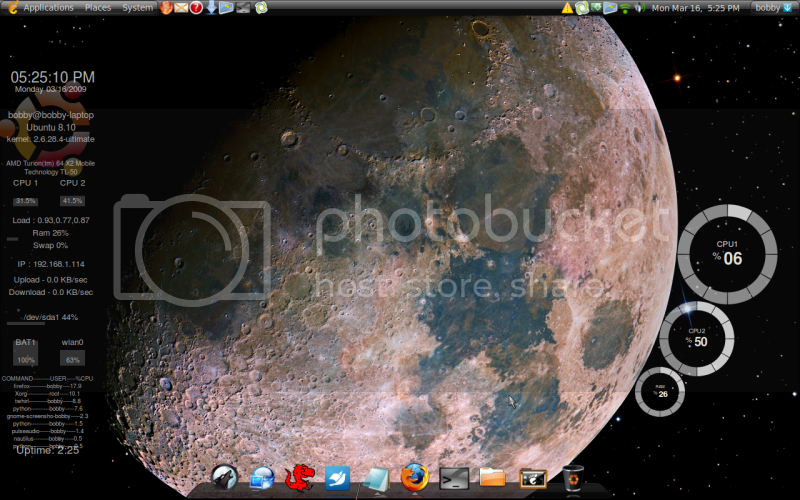 It‚Äôs Ubuntu 8.10 using the ‚ÄòSlicknesS‚Äô theme and ‚ÄòHydrogen‚Äô icon set. The dock is Avant Window Navigator and the widgets are Screenlets, both of which are in GNOME running Compiz. all very nice, i was looking for a mac os x like dock for xfce, anyone know of one? Very light. Does not require compositing. non riesco a vederli grandi. I'm really fond of Hanna's set up, looks awesome. I agree it is freaking awesome! Very professional looking. Openbox on one of my x86_64 CLFS machines. WOAH. I'm impressed. What WM are you running? And what theme? Edit: Silly me didn't read the window that said openbox. Oops! Here's mine netbook one. I can't be bothered to boot up my PC right now.